For most robo-advisors creating value for clients is mostly about low costs and high efficiency. This leads to a margin war, where only a handful of aggressive market players will survive. Is there a way to escape the pricing war? Instead of simply buying ETFs some robos try to add another ingredient, like active management to their service. The problem is that this approach already levels up costs and the more market players try to deliver alpha to their client, the higher share of them will fail to achieve this, which questions their very existence even when their management fees will still be below traditional asset managers. It’s true that one of the most important value creators for end-users is the low cost itself, and it’s a clear tendency that the lower the costs the higher the return. The common misconception is that clients only care about the return, and maybe the risk. Yet, there is another dimension to investment, which is personal value preference. In the traditional asset management world more and more people feel uncomfortable to hold oil, weapons, tobacco and similar so-called vice industries in their portfolios. The institutional market participants feel the pressure and most of them started to apply Environmental, Social and Governance (ESG) criteria to their selection process. A typical data-driven task which can be ideal to digital leaders such as robo-advisors. Furthermore giving the possibility of being socially responsible is a great selling-point and creator of high loyalty in the industry. 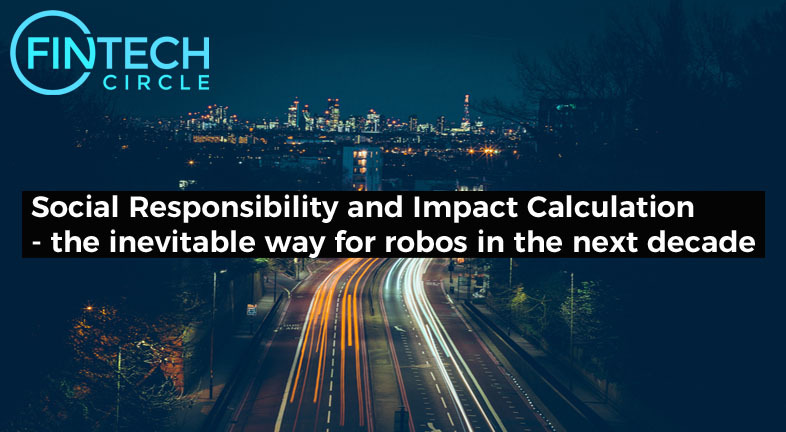 At the same time when the robo creates the first portfolio suggestion to the clients they could provide an exact impact calculation of the portfolio stocks. This makes the investment service more acceptable creating value for the client at the same low-cost without giving up margins. No wonder it makes a promising future for the industry.